Style is a tough thing for me. My tastes straddle an imagined and contradictory line between individualism and establishment. I don’t want to be an old fuddy-duddy with the tucked-in stuff and same button-up in 11 colors. But I don’t want to be that ultra-trendy, douche-sniffer you see in GQ. I definitely don’t want to be some hippie-bum either. Why can’t my style say I’m anti-anti-establishment without being establishment? Why can’t it say I’m a regular guy who’s like nobody else? If there’s one thing we all have too many of, it’s t-shirts. How do we get them all? Sports teams (participating and cheering), concerts, walks for diseases, fun runs, arena cannons, pre-party Goodwill trips, hand-me-downs, hand-me-ups, company handouts, and the rarest way to acquire a t-shirt: purchase. While I’m inactively trying to retract my wardrobe, I want to be constantly adding quality to remain relevant in my personal cycles of fashion. The t-shirt rarely gets much attention from style aficionados, but I’m still ready to upgrade my plethora of high school and college lingerers with the following five selections that will probably always be cool in terms of nostalgia or self-deprecation (or both). 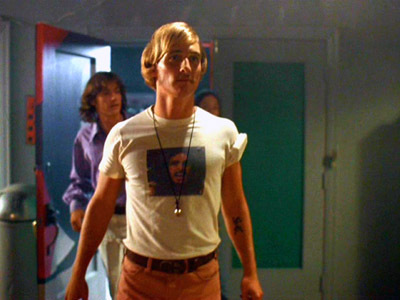 Don’t act like we didn’t all know this was a timeless look from the first time David Wooderson explained what he loved about high school girls. The picture itself is actually the cover of the Tooth, Fang and Claw LP by Ted Nugent and the Amboy Dukes. You’re going to want to be able to serve that knowledge nugget with swagger while adjusting your rolled-up sleeves. Nothing is less Wooderson than not having it all figured out. The OC. 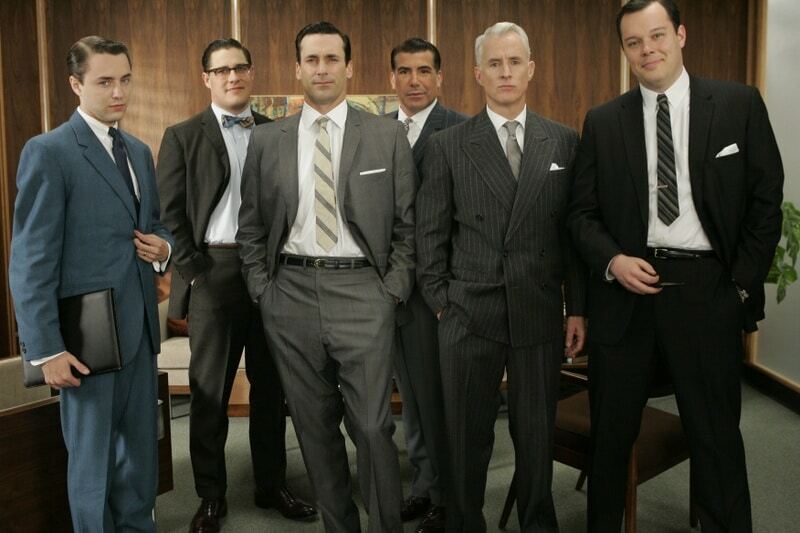 Underrated show in my opinion (that of a straight male. I think most women and the “other” category probably ranked it appropriately…which could be an interesting social commentary when applied to other topics as well). 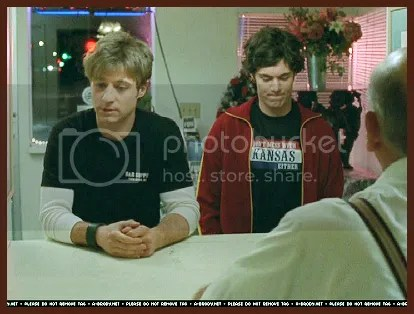 One of the best things about this show is that it had Seth Cohen, a rich, Californian Jew with a fashion sense that belonged to an Italian-American lead singer of an emo band in Indiana. His t-shirts were always on point. Being from Kansas, I thought this shirt hit the right note between tough guy complex and inferiority complex. Textile gold. I’m going to say what you’re thinking. Cliche! Maybe it is, but I loved Fast Times at Ridgemont High. And after I started thinking about it, the truth is that I don’t actually know that many people that own a tuxedo t-shirt. I know even fewer that I’ve actually seen wearing it out and about. I don’t have to recite it’s well-known merits, but the picture of Ryan Gosling wearing it should prove that they’re all true. This may be the definitive attire of the gifted slacker. A plain black t-shirt that says nothing but your name. It screams brash and lazy, and it does so in the the only two colors that mattered in a pre-fashion world (I know that’s inaccurate, but it felt cool to type). This might be exactly what I’m looking for. The kind of t-shirt that boasts individuality while being so unoriginal. It’s so shallow that it’s deep. Of course, mine will say “D U S T Y”. Kidding. Just because Jimmy Buffet can rock this while posing with centerfolds doesn’t mean a single other man on the planet could. I wonder if the manufacturers of this t-shirt only made one, a custom-fit for Jimmy? I would obviously wear this ironically because I’m not a hipster. 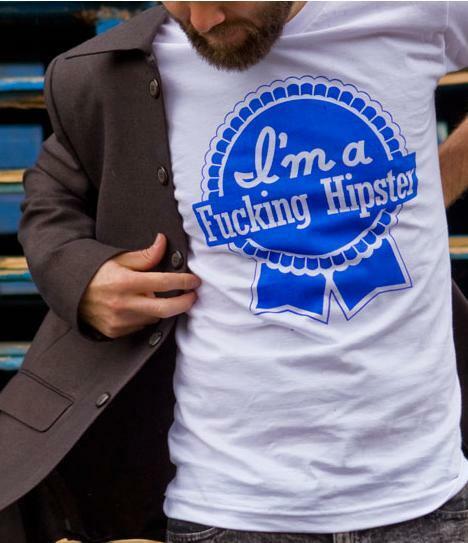 On a second layer of irony, wearing a t-shirt ironically is exactly the kind of thing a hipster would do. Perhaps the irony is lost only on me, as I insist I’m not a hipster. Maybe I’m the hipster of hipsters, finding a post-post-modern worldview where awareness of self-confusion trumps self-awareness. Maybe nobody’s going to appreciate the mindless drivel I’m associating with this t-shirt. In which case, I can just give it to Dr. Tom to wear without a lick of irony.